Twenty years old is a grand age for a literary anthology. The Geneva Writers’ Group celebrates this anniversary with Offshoots 10. We members of the GWG are nearly all foreign to Geneva and if we write in English that does not necessarily mean the language is our mother tongue or even that we use it daily. Still, it remains our common denominator; we use the English language as an extension of ourselves. As strangers, we have all felt the Earth tilt on its axis and we have not always been sure if we are turning towards or away from the sun. But though we are uprooted, we continue to send out new shoots, nourished by loamy, invisible soil. Offshoots 10 reflects our maturity. We hope our anthology goes beyond alienation and nostalgia, twin stumbling blocks for all writers living abroad, to reveal compassion and an affirmation of life over and beyond the tragedies and absurdities we encounter. Often nature is our solace, we vibrate to its seasons and diversity, though we also write about its raw destructive forces as well as the damage we humans inflict on the natural world. In a fundamental way, we recognize that life and death move within mystery. 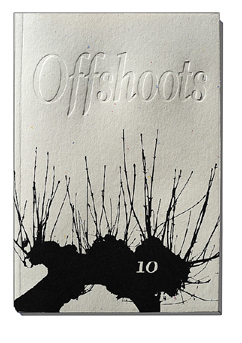 Offshoots 10 is rooted in universal emotions: love, anger, grief, fear, joy, reverence and enduring hope. We affirm the importance of relationships. We deliberately write both about ourselves and “the other” and we use farce, pathos, poetry and myth, tools passed down to us from generation to generation. Ever since our predecessors told stories by firelight in shadowy caves, we writers have needed to express our feelings and experiences in an attempt to acquire purpose and understanding about our lives and the world around us. The texts are arranged in loose cyclical order so that they mirror a human being’s spiralling physical and emotional growth. If our sweet words quicken your spirit or provoke a smile, then we have succeeded and we are celebrating together our common humanity.